New York is probably the only city in the world that people can claim to know without having been in it. It is that engraved in our worldwide culture. But these preconceptions will give you an impression of the city such as you would get from a speeding express. 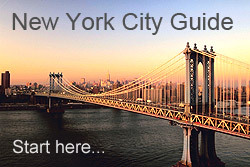 This city guide will provide you all the information you need to understand what New York is really about. New York was made by idealists, adventurers, opportunists, religious and political refugees, scoundrels on the run or simple men and women who hoped to begin anew. They created a fascinating city. A city of charlatans and thinkers, of grit and class. The result wasn't a chaotic mix of cultures, but a synergic whole beyond the sum of its parts. This city guide will show that New York. Click here to learn all you need to know before travelling to America. What New York is a guide about a city. We are not trying to sell you experiences. We want to give you all the information for you to decide. That's why our sections are sequenced in the natural order of a trip: About New York is what a guide with all you need to know before you leave for the city. Then Transportation will give you all the information about getting around in New York City. And so on. By clicking on a borough in the New York City Guide section, or an area in the Culture section, you will see all the important things that surround it. In the case of the City Guide, you will find highlighted sights, neighborhood spots you just can't miss and, of course, where to eat.